Created by Norman Latourelle, one of the co-founders of Cirque du Soleil, Cavalia’s new production “Odysseo” combines equestrian arts with aerial performance and live music along with elaborate sets and visuals in a stunning production. The show features 65 horses and 48 performers in a 346’ x 240’ x 83’ main tent, billed as the largest tent currently touring, in a temporary city composed of the performance arena, stables, paddocks, and tents that travel to each stop on the show’s tour. "Odysseo Les Voyageurs" by François Bergeron is licensed under CC BY 2.0. Odysseo is currently the largest touring production in the world and bringing the show to Chicago posed many challenges. Cavalia uses the same production equipment for each stop, requiring that the single set comply with codes for each jurisdiction. The City of Chicago has its own unique building code and requirements for special events and given the elaborate nature of the production, a complex set of approvals was required. Burnham Nationwide’s Chicago division lent its expertise throughout the permitting process to help build this unique performance space in a short timeframe. In the City of Chicago, special events must have permits, including but not limited to tent permits, bleacher permits, food service permits, and sign permits. Depending on the scope, approvals required can range from the City of Chicago Department of Buildings (DOB) and the City of Chicago Department of Planning and Development (DPD), to the City of Chicago Police Department, Chicago Park District, and additional venue reviews. Cavalia USA Inc. utilized Burnham Nationwide to help navigate Chicago’s codes and permit processes. The initial step involved meeting with the Chicago Department of Cultural Affairs and Special Events (DCASE) as well as the Chicago Department of Buildings (DOB), the agency responsible for the majority of the permitting process to introduce the project and discuss strategy and code requirements. Unlike typical special events permitting, creating the performance space did not involve a stage. Instead, the performance area was constructed using engineered soil, with the bleachers installed around the arena area under the main tent. Burnham Nationwide secured the bleacher and tent permits for the main tent, staff catering tent, performer warm up tents, stables and VIP tents that serve as the grounds for the show. Burnham was able to successfully navigate the requirements that stipulate that there are no structures allowed within 20 feet of a tent so that the required kitchen and other structures could be constructed at the site, through approvals from multiple commissioners. This allowed Cavalia to retain vital aspects of their infrastructure. In addition to the Chicago DCASE and DOB approvals, the plans for the site work and tent spaces required approval from the Chicago Department of Planning and Development, the City of Chicago Police Department, the Chicago Park District, the Chicago Fire Department Fire Prevention Bureau, and by Soldier Field, the show’s venue. Approval was also secured from the alderman for the 3rd Ward where Soldier Field is located. Burnham also coordinated a preliminary inspection for the installations so that Cavalia was able to address any outstanding items and best prepare for the final inspection process by the Department of Buildings, Special Events, Police and Fire. Burnham Nationwide also assisted with obtaining the required special event sign permit for the production. This required approval from the alderman for the 3rd Ward, the Chicago Park District, and well as the DPD. The signage was installed on stacked shipping containers which required special approval by the Department of Buildings’ Deputy Commissioner. By utilizing Burnham’s services, Cavalia was able to premiere Odysseo on April 1st and continues to mesmerize audiences in the City of Chicago. 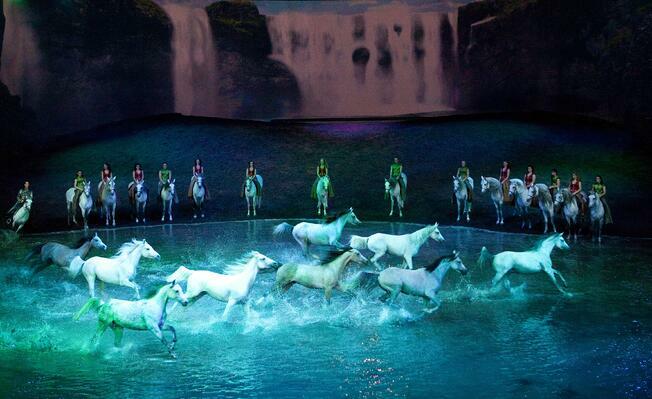 At time of writing, Odysseo has extended its run through May 7th, and tickets are available at Cavalia’s website.